Apple may be hard at work perfecting iOS 11 for its big debut at this year’s Worldwide Developers Conference (WWDC 2017), but that is not going to stop the jailbreak community from pushing the boundaries of what iOS 10 can offer. With the tweaks that they create and release on Cydia, jailbreak developers often inadvertently predict what Apple will bring to the next major release of iOS, and in Falcon, we have another to which Apple could do well to pay attention. Available to download from the BigBoss repository via the Cydia jailbreak store, Falcon costs $1.49. In exchange for that, you will receive a tweak that takes the iOS lock screen and Notification Center shade and gives them both additional functionality that could save valuable time as well as give power users access to some things they are always in need of. Backing up for a second, Falcon’s power lies in what it is that it adds. 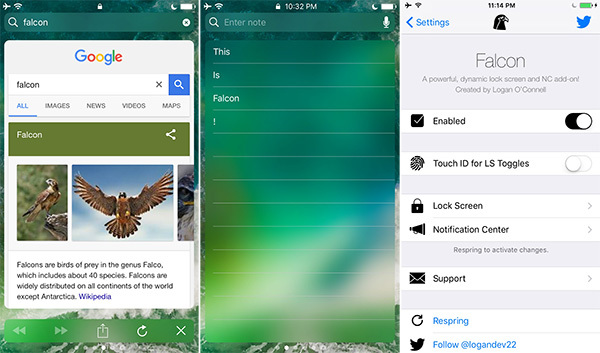 Once installed, Falcon takes the lock screen and Notification Center and gives them immediate access to three things, all of which we can imagine people getting plenty of use out of – a web browser, somewhere to take notes, and a collection of toggles. Accessing these things is a case of swiping the screen on a locked iOS device or pulling down the Notification Center. Instant access to a web browser, somewhere to very quickly type things that need to be remembered and toggles such as Airplane Mode, the flashlight, VPN and more. Everything is within a couple of swipes at all times, and that can be invaluable. We love tweaks that make things easier to do or quicker to access and Falcon ticks both of those boxes. At $1.49, we think it is a bit of a steal, so be sure to check it out if any of its features sound like something you could take advantage of. Please ISX10 and springtomize! PLEASE! Plus cydia eraser and prometheus tool so we can NEVER have to upgrade if we need to restore and can keep our jailbreak. Falcon keeps crashing my springboard and goes to safe mode? Lol who are you begging to?